The Bruny Island Cheese Company operates a factory and cellar door at picturesque Great Bay on bruny island in the south of Tasmania. The facility is open seven days a week. top awards at the annual food festivals in Tasmania. Bruny Island Cheese Company produces hand-made cheeses and butter, using organic milk from cows and goats, and exports its products to mainland Australia. Bruny Island Cheese Company also makes fine condiments. 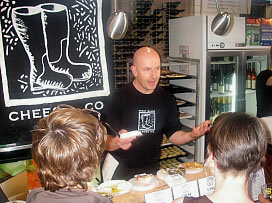 At the 2006 taste of tasmania food festival, Bruny Island Cheese Company won the Best Food Stall award. Proprietor Nick Haddow said that sales at the Taste had increased 25% over the previous year. They sold more than 400 kilos of cheese, running out of stock on the last day. At the 2007 festivale food and wine showcase, held in Launceston in February 2007, Bruny Island Cheese Company shared first prize for the best food stall.